Greetings again from the darkness. A popular proverb “Home is where the heart is” is filled with truth … unless the heart belongs in two places. Such is the case with Ellis, an Irish girl who leaves behind her family and homeland to discover the new world opportunities afforded by 1950’s America. The film is based on the popular and critically-acclaimed novel from Colm Toibin, and is directed by John Crowley (Is Anybody There? 2008) with a screenplay from Nick Hornby (About a Boy, An Education). It’s a blend of romance, drama, and self-discovery, while also examining a couple of diverse cultures from lands separated by more than 3000 miles (and a big ocean). 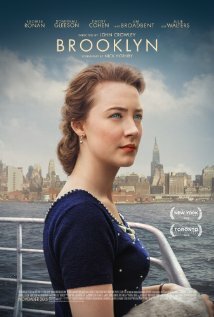 Saoirse Ronan plays Ellis in a performance that is sure to garner much Oscar talk. It’s only been 8 years since Ms. Ronan exploded onto the screen as 13 year old Briony in Atonement. In this current role we watch her blossom like a flower as she grows from a timid and reserved shop girl with a bleak future in Ireland, to a fully-realized woman with much spirit and hope. On that journey, she experiences many life obstacles including seasickness, homesickness, catty and envious housemates, heartbreak and romantic awkwardness … all while dealing with the overwhelming nature of her new world. Director Cowley makes some interesting visual choices. We begin with a muted color palette and mostly close camera shots of Ellis’ life in Ireland. This “closed in” feeling continues through her crossing of the Atlantic. However, once she steps through the blue doors of Ellis Island, the world opens up with wide shots and shocks of bright colors. These contrasts blend together in the third segment where Ellis returns to Ireland after a family tragedy. The look of the film at any given time mirrors the mood and circumstance of our lead character. Ellis struggles to adjust to the United States, both in the bordering house run by the colorful Ms. Kehoe (a terrific Julie Walters), and in the ritzy Bartocci store where she clerks for a demanding supervisor (Jessica Pare’, “Mad Men”). Ms. Kehoe provides her girls with such life guidance as “Giddiness is the 8th Deadly Sin”. 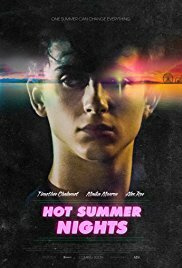 It doesn’t take long for Ellis to meet Tony (a breakout performance by Emory Cohen, The Place Beyond the Pines), a pleasant and polite local Italian plumber who is enchanted by her. Their time together provides a wonderful comparison piece for today’s courtship vs. that of the 1950’s. The movie is beautifully paced, filmed and acted; however, there are some issues to fight through with the story and details of the main character. Her return to Ireland introduces Jim Ferrell (solid work from the ever-evolving Domhnall Gleeson), and just like that, Ellis is confused about Tony’s line: “This is where your life is”. This time of confusion for her, creates similar type confusion for viewers as we either understand her uncertainty, or question it. This distracts a bit from some of the impactful elements like her transition from clueless fish-out-of-water on her first cruise, to strong mentor for an Irish girl much like her younger self on a later trip. The script has more than a few of these moments of gold, and Saoirse brilliantly nails each. Greetings again from the darkness. With an extended tracking shot to open the film, we follow Ryan Gosling, a motorcycle stunt rider, from his trailer through the carnival grounds and right into the metal sphere with his co-riders. It’s an exhilarating start to the film and introduces Luke (Gosling) as a heavily-tatted star attraction on the carnival circuit. This is director Derek Cianfrance’s follow-up to his 2010 critically acclaimed Blue Valentine (which also featured Gosling). While that film painfully presented the gut-wrenching misery of a crumbling marriage, this latest shows multi-generational fallout from poor decisions and faulty father-son relationships. Cianfrance has quite an eye for well-intentioned, but inadequate personality types. This latest is presented in triptych format … three distinct story divisions. The first segment is mesmerizing and top notch filmmaking. It follows Luke’s attempt to “do right” by his newly discovered infant son – the result of last year’s carnival trip to this same town and a tryst with Romina, a local gal played by Eva Mendes. Gosling is especially effective (yet again) as he falls in with a local mechanic played by a terrific Ben Mendelsohn (frightening in Animal Kingdom). The two hatch a scheme to capitalize on Luke’s bike riding skills by robbing banks. These “jobs” allow us to see the other side of Luke, who seems sincere in his desire to provide for the child and win back Romina. Things go badly when Luke crosses paths with rookie street cop Avery Cross (played by Bradley Cooper). Watching Gosling’s contradictory personalities is quite amazing … he flips from quietly charming to cold-blooded brutal bank robber in the blink of an eye. The story then shifts to follow Avery and his strained relations with his wife (Rose Byrne), their infant son, and Avery’s former state Supreme Court judge father (Harris Yulin). A sub-plot brings in police department corruption led by … who else? … Ray Liotta. Mr. Liotta still possesses the beady-eyed stare that can scare the crap out of his fellow actors and anyone watching the movie. This corruption and the idealistic and ambitious nature of Avery aren’t a very pleasant mixture, but it sets the stage for the final act. Flashing forward 15 years, brings us to a fairly predictable situation that still proves interesting. The previous stories focused on the failed relationships of Luke and his father, Luke and his mis-fired attempt at being a dad, and the awkwardness of Avery and his father. Now we see the resulting mess that are the two now teenage boys. The sons are played by Emory Cohen and Dane DeHaan (memorable as Cricket in Lawless). DeHaan especially shines as the Gosling/Mendes prodigy. Sean Bobbitt is the film’s Director of Photography and he deserves special mention for his work with Cianfrance in bringing a different and intimate look to the characters, setting and story. Also, Mike Patton’s unusual score fits perfectly and keeps the viewer on track. This is a very uncomfortable movie to watch, but those who enjoy tough, artsy films will be rewarded. *NOTE: During the Q&A after the screening, director Cianfrance mentioned that Ryan Gosling is not “typical” actor, but that he has quite a feel for characters and visual story telling. Unfortunately, a couple of days later Mr. Gosling announced he was taking a sabbatical from acting. Luckily for us, he has built a pipeline of movies that should keep us satisfied for the next couple of years. SKIP THIS MOVIE IF: you are looking for an uplifting, inspirational story … no superheroes saving the world in this one.